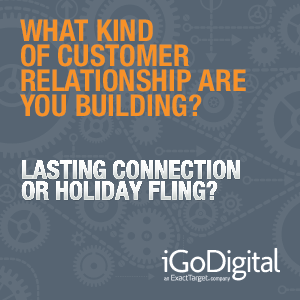 Any lasting customer relationship begins with an initial interaction, and for many shoppers, the holidays were like a first date on your site. Now, the “getting to know you” process begins with these thousands of new customers. With each click, these shoppers are giving you access to their thoughts and buying habits. Each product viewed, description clicked, shopping cart filled and item purchased gives you insight into each unique shopper’s wants, needs, preferences and lifestyles. And just like an enamored suitor who wants to continue the courtship, using what you know about each customer to speak directly to them will help build a 1:1 connection far after the holiday rush. Your most loyal customers are your most profitable ones. Utilizing personalization and segmentation strategies, retailers can leverage all of the data being collected during the holidays to turn these holiday flings into lasting relationships.